Urgh. Can someone hand me a tissue? I'm feeling a bit sorry for myself today. I'm completely full up with a cold, my eyes & nose are streaming, I have a sore throat & a pounding headache that won't shift. I said to MR.B this morning if I had a job to go to, I'd call in sick & spend the day under the duvet, sleeping it off & watching trash TV. 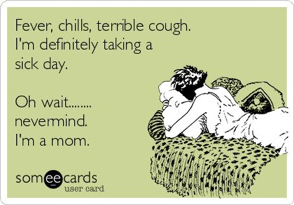 But that's not an option for me, I have 3 children to look after, typical me falling ill during the Half-Term! Obviously it is awful to be poorly at any time, but Jesus being ill whilst in charge of a baby, 6yr old & 8yr old is like a 12 hour battle of will where only the strongest survive. 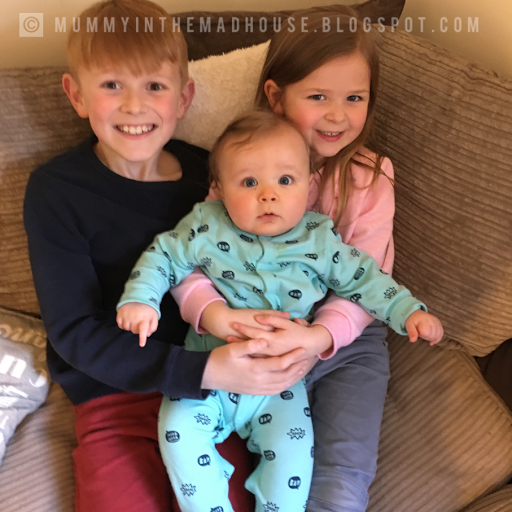 What does a sick day look like for a stay-at-home mum? Exactly like a well day- baby still needs to be fed, meals need to be seen to, children need to be kept entertained. You can't just clock off when your poorly when your a parent. There's only a few things I can do to make my ill day a bit more bearable & I'm going to share them with you. Here are my sick parent survival tips. Be a sloth & do the bare minimum. Washing & housework can wait, you can catch up on everything when you are well. Just make sure everyone gets fed & stays alive. Throw your "Perfect Parent" hat out the window. You probably have wonderful routines that make you the great parent that you are. Forget all about that. Don't worry about the TV being on non-stop or the use of iPads, X-boxes etc to be used as a distraction... if the children are entertained & happy, then enjoy the time you can to relax, you are poorly after all! Your children will probably think your the best mum ever! Bring all duvets & pillows down in the living room. Make a bed on the sofa & another on the floor for the children, DVDs can be your friend, the longer the better, you want your children quiet & in a spot where you can see them with your one half-opened eye. Order in a takeaway. Means no cooking & minimal clearing up after. The children will love it. Make up for it by eating nothing but greens for a few days when you are well again. Remember, the key with these ideas is for you to rest as much as you can. You are NOT a bad mum because your children are not eating freshly prepared gourmet meals or they are watching a thousand episodes of Peppa bloody Pig with you on the sofa. It is perfectly acceptable for you to lay down, be lazy and Rest during this time. These are my excuses anyway & I'm sticking to them! I'm counting down the hours to 7pm, when baby will hopefully, fingers crossed will be going to bed & I can recoup-orate & be well for tomorrow. Hopefully.